Musikladen was a Radio Bremen production, broadcast on ARD from 13 December 1972 until 29 November 1984 and contained 90 episodes. 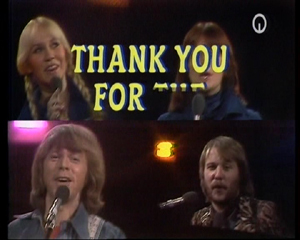 SOS had been recorded in 1975 and inserted into the programme. The outro of Dancing Queen sounds different to the released version. It seems to be a few seconds longer and you hear the almost bare instruments a bit better. Mamma Mia also sounded a bit different compared to the released version. In the special it sounds like the drums are more noticeable (having a tougher, dry, punchier sound). The mix for Fernando is a different mix from the version released on record. The differences are most noticeable in the instrumental spaces between lines of the chorus - the chime-like keyboards and guitar strums are much 'hotter' in the mix and it sounds a little "Christmassy". The opening of the programme featured a few lines of Ring Ring (Swedish version). There was also a brief interview with the group interspersed with the songs. Benny had never sounded as Swedish. The programme was directed and produced by Michael Leckebusch. 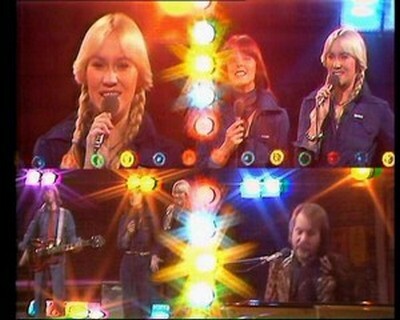 Mamma Mia and Fernando only were first shown on a regular Musikladen programme on 6 March 1976 (episode 25). The full programme Musikladen Extra included all the songs. 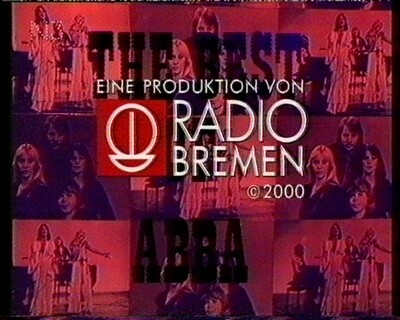 Pictures from the performances from Musikladen Extra were featured heavily on the cover of the album The Very Best of ABBA released in Germany, Austria and The Netherlands. The Australian version called, ABBA In Europe was 'hosted' by Johnny Farnham (later to be known as John Farnham who had a big hit with You're The Voice) who topped and tailed the show. Fernando and Rock Me were repeated at the end of the show because they were apparently his favourite songs. The programme was so popular it was repeated not long afterwards. The promo trailers for the show included the announcement that it included the then unreleased song Dancing Queen. Most of the clips were re-packaged a few months later as ABBA In Sweden but this time interspersed with interview footage and topped and tailed with the performance of Money Money Money from ABBA-dabba-dooo!! According to newspaper reports from the time, this programme was sold to over thirty countries. After a few years of speculation finally Musikladen will be produced for a DVD release in August 2010. Apparently it was given up on originally because a long list of right-holders would not give their permission to give it a DVD release. Someone is however keeping an eye on YouTube because clips keep disappearing with the words, "This video is no longer available due to a copyright claim by Studio Hamburg Distribution & Marketing GmbH (SHDM)"
This programme, broadcast in 1999, showed some interesting differences in some of the Musikladen Extra clips. Waterloo - If you've always found the Waterloo performance annoying because of the flashing lights, then there is evidence that a version without the flashing lights does exist - as per the opening credits of the German broadcast of Thank you For the Music (25 Jahre ABBA). Tropical Loveland - Thank You For The Music (25 Jahre ABBA) showed a slightly extended version of Tropical Loveland where Frida was messing about at the end of the song and they all put down their microphones and walk off the stage. Dancing Queen - One eagle-eyed fan has spotted a different version. 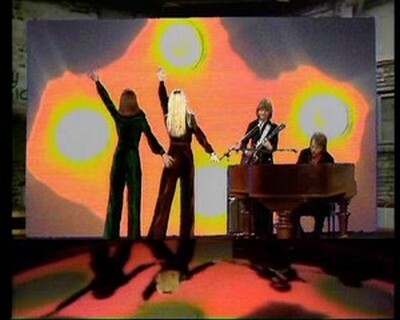 The version featured in the original The Best of ABBA (Musikladen Extra) shows the reflection of ABBA in the floor. However, in the German TV Special Thank you For the Music (25 Jahre ABBA), a version was broadcast where the Musikladen logo is on the floor instead. You can compare the two versions together here. I've Been Waiting For You - This different edit has materialised on YouTube with a cold start (you see them standing waiting for the music to start and Frida moves her left arm whilst preparing for the song to start) together with other camera angles and no red kaleidoscope effects, although much of it is still the same as the original. At the end, notice Agnetha turns around full circle and you get wonderful shots of the back of her head! Thanks so much to Erik Liebstaedter and SADL00KINM00N for the link. This was NOT part of the German TV Special Thank you For the Music (25 Jahre ABBA) - so where does it come from? You can compare the two versions together here. Fernando was broadcast on German TV channel NDR (Norddeutscher Rundfunk, the local channel of the ARD/ZDF for the north of Germany) on Das große Wunschkonzert (The Big Musical Request Programme). The ratio was cut to 16:9 and it was the original alternative mix on the soundtrack. This Musikladen programme was released by ARD in August 2010 on their 1972-1976 Best of DVD box set of 10 DVDs (there were three available at 99.95 Euros each or 249 Euros for all three). The box set 1 included a 44-page booklet with liner notes and information about each episode and also includes some pictures. 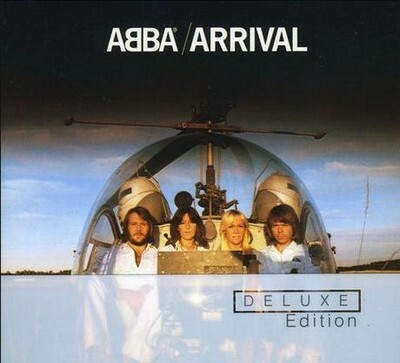 For episodes 20 and 25 there are a few lines about ABBA while for episode 27 they explain how the Double LP The Very Best Of ABBA, ABBA's Greatest Hits came about. However, since November 2010, these boxes (including Box 2: 1976-1980 incl. Chiquitita (1979) and Box 3: 1981-1984 incl. solo performances) are no longer available because of copyright issues between the ARD and "a music company". 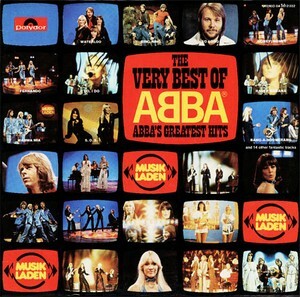 According ABBA Intermezzo, in December 2010, "We have heard that fans are discussing whether it could be Universal objecting to the release of the Musikladen DVDs featuring ABBA performances. Unfortunately we can't tell you which record company is taking action against the release, but we can 100% confirm you that it's not because of the ABBA performances. A permission for this has been granted long ago." Interview - Agnetha having a little giggle with Frida like a naughty school girl! Fernando - Frida is wearing her Frida Ensam dress while Agnetha is wearing the 'gypsy dress' for its first appearance. So Long - Frida's enthusiastic dancing! Björn: Well, I don't think there's really prescription. You just have to be very, very careful so that you don't copy the hit before. Like, say we would have copied Waterloo. Then we would have been finished in one or two years. Benny: That's very American, I think. There's a lot of groups or artists copying their first hit, knowing that they're following, I mean, the spin-off. Coming after that will still sell their record, whatever it is. So they try to make it as similar as possible. I think that's very dangerous. Björn: You have to change all the time. Frida: If you're asking me? Yes. I like to sing, naturally. Of course I do. And I like very much to dance. And to be on stage. Benny: Well, it's different because, I think, the most inspiring thing about all this, we are doing, is that to be in it from the beginning. From the song, from the melody. And the recording, the arrangement. The production. Even the marketing. As we are doing. Then followed it up with being on stage. The promotion and all that. That's fantastic. Interviewer: How about you two? Agnetha: I like the recording very much. And sometimes to stand on a stage. But not always. Björn: And for me, I think, I agree with Benny. It's fascinating to have total control. So that every phase of it. You're in it. Frida: Benny and I are engaged. And Björn and Anna are married. Interviewer: And where do you live? Interviewer: In Stockholm. Close to each other? In the same house? Benny: Not the same house. Interviewer: Where do you get the ideas from? Björn: We just sit down and work. As far as writing is concerned. We sit down with piano and guitar and we start working. Interviewer: But what does it start with. With the text or with music? Benny: With the music. Always with the music. Interviewer: Always with the music. And who writes the music? Frida: Björn and Benny writes the music. Interviewer: And who writes the text? Frida: It's our manager called Stikkan Anderson. Interviewer: And what do the girls do in this whole thing? Benny: They do the rest. Interviewer: They do the rest. They do the singing but how about arrangements? Benny: Well, some of the vocal arrangements and all that in the studio, yes. We work very close together. Interviewer: How does the choreography? Frida: We have a teacher. He is called Graham Tainton. He has been working with us since we started the group. Thanks to Pawel Ruczko, Petri Kaasalainen, Maria Nicholas, Joachim, Philip Muytjens, Harold Hanlon, Henk, Walter Veldman, Markus, Ronnie Mehlis, Martin Borus, Jozsef, Erik Liebstaedter, Jun Seo, Jason Swan, Guido, Karen Danzilio, Sam Shervz, Ian Cole and Robert Verbeek (RIP), Richard Knight, Luke Rogers, Grant Whittingham and Ken Griffin c/o ABBAMAIL (no longer online). Huge thanks to Dustin and Karin Angeleyes and more thanks to Dionne Kennedy, Pascale Ranson and Roxanne Dickson c/o ABBA Village and Regina Grafunder at Intermezzo.